Say I have a bunch of screws. Say they are all flat (countersunk) head, phillips drive. They can be different shank/root diameter, with or without a smooth shank, different thread coarseness, color, etc. They all have a pointy end, about the same angle of point with maybe a small difference in how far from the point the threading ends. They are all magnetic. 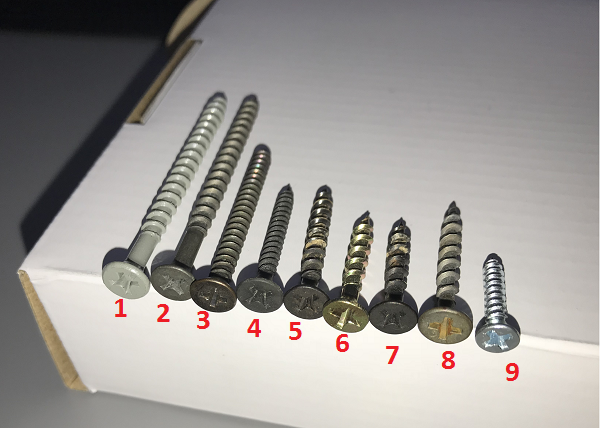 I know screw #1 is a decking screw and I know that screw #7 is drywall, because that's what the packages said. #6 is brass-color and #8 is gray (and rust), the others being the color they look to be. Wood screws will generally have a smooth shank at the top, being wood screws, but some (like #9 I think) don't. And a lot of drywall screws are black. I have a lot of loose screws. How can I determine the types of screws? Drywall screws have a “bugle head”. Flat head wood screws have a “tapered head”. what kind of sheet-metal screw do I need for wood to 1/8" steel? Alternative for one-way sheet metal screw?